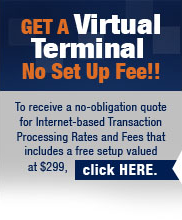 Virtual terminals allow you to securely process credit card transactions from any computer, phone, or website. No matter where you are in the world, your virtual terminal will handle every step of the credit card processing, making it easy for you to take your business mobile or setup a website to accept payments. Learn about our full line of virtual terminal solutions below.